Rafal stayed in the hospital for four months: September, October, November and December. 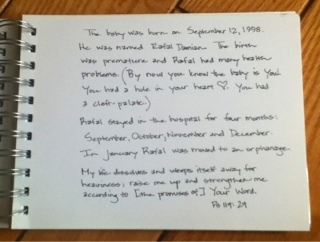 In January Rafal was moved to an orphanage. Rafal was alone. His birth mother did not stay. Doctors and nurses checked on him, fed him and worked on keeping him alive. When he cried, no one picked him up. He was sad. 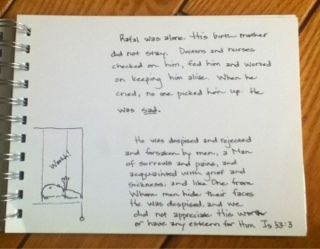 Rafal lived in the orphanage after he was released from the hospital. 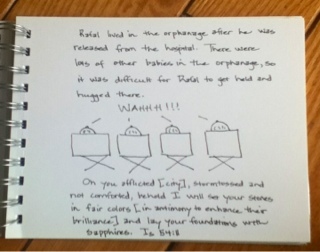 There were lots of other babies in the orphanage, so it was difficult for Rafal to get held there. WAHHHHH! 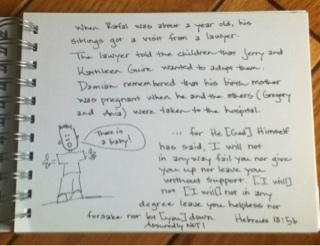 When Rafal was about a year old, his siblings got a visit from a lawyer. The lawyer told the children that Jerry and Kathleen Guire wanted to adopt them. Damian remembered that his birth mother was pregnant when he and the others (Gregory and Ania) were taken to the hospital. 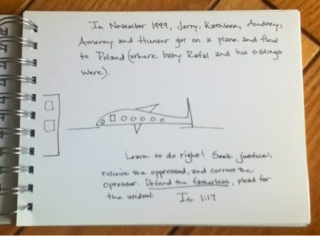 In November 1999, Jerry, Kathleen, Audrey, Amerey and Hunter got on a plane and flew to Poland (where baby Rafal and his siblings were). Identity Book — what a great idea!